Most of March was occupied with putting the house back to some normaility following the new kitchen fitting. It's an ongoing project!! However, a widened driveway and new gates have been added to this months completed projects. For his final World Book Day at primary school, Euan chose to be Mr Twit. This involved a purple suit, bushy beard and wig. It was very effective. We also had the final primary parents night. Euan continues to do well but needs to be reminded that he isn't always right!! 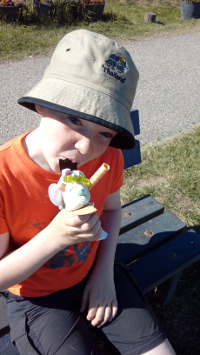 Euan took part in his first Scout camp this month at Douglaswood on the outskirts of Dundee. The weather was kind to them and he had great fun, including making mug cakes and smelting woggles. Mummy had a week of annual leave at the end of the month. The weather was great so plently of long walks around Errol...and to collect Euan from school. Auntie Jennifer popped down to Dundee for a visit so we had a wander round the V&A. Jennifer thought it was nice but not living up to the hype!! The month was rounded off by a gardening day resulting intwo skip runs to get rid of the debris. March over already! Just like that! We started of the month of March with World Book Day! I dressed up as Mr Twit with a purple jacket, some purple trousers and a glue bucket. I also had a fake beard and hair! It was really fun doing World Book Day for the last time. Then I had ACWAI 2019! At camp I had great fun making Mug cakes and crepes! We also made woggles out of pewter and an escape room! On the last day my team won a box of Maltesers each! Then it was Parents Evening! I got a reasonably good report in my opinion! Overall this has been a really good month and I hope it will be the same this month! Hope you all have a great Easter and have a nice time! Copyright © 2018 Jolly John. All Rights Reserved. Designed by John Steven.